Anyone know what bird this skin is? Looks like it is missing the head and neck. (crest & tippets) but it's hard to tell. I was going to guess golden as well. Based on the white feathers on the neck my first thought was Lady Amherst. Thanks guys. 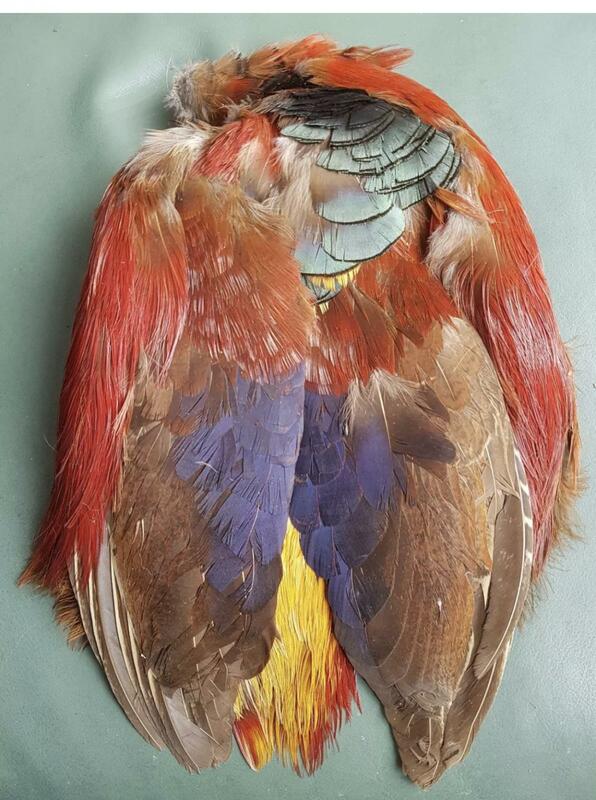 I saw this for sale and all those lovely red feathers made me think it was a rare bird. That is just the body the Head and crest, and the tail, are all missing. They are, of course, the more useful parts. As that skin sits don't pay more than $5 for it. You may not even get value for your money out of it then. Off hand I can only think of one pattern that uses those feathers. Formal patterns, yep not much use but the body feathers still have a good effect on soft hackle patterns. Plenty of fibres to tail nymphs and they are far from useless skins. I have a couple of the hot orange ones Cookshill does and find them useful. It has its uses, but was retailed for about £2:50 when I last saw one sans head and tail. $5 would be expensive given the exchange rate. With Steve's (Cookshill) you will pay more for the dying than the skin. That was my first thought looking at that. What feathers are any good on it? I have used the red whispy feathers carefully tied as soft hackles and maybe some of them could be used in a Mrs. Simpson but overall the best feathers just ain't there anymore. Most of the body feathers are great for panfish flies, especially the breast and rump feathers. Wing feathers can be used for winged wets. I bet those greenish-blue neck feathers could be used on streamers. I've also played around a time or two with the rump and breast feathers trying to tie spey-type flies...horrible results but that was an operator error thing.